I have long been a big fan of the MusicMan instruments and I think they make some of the best bolt-neck production basses on the market. Their most famous instrument has to be the Stingray bass that was designed by Leo Fender and Tom Walker back in the mid 1970s. This was one of the earliest productions basses with an active pre-amplifier, if not the first. This gave it more output and a more aggressive sound than the competition. Ever since Ernie Ball Strings bought the MusicMan brand in the 1980s, there have been new models introduced: Cutlass, Sabre, Stingray 5, Sterling, Bongo, and the Big Al; oodles of variations of each have been introduced with different string configurations , woods, and electronics packages. One thing they have not had is a bass with passive electronics, until they came out with the new Caprice bass. 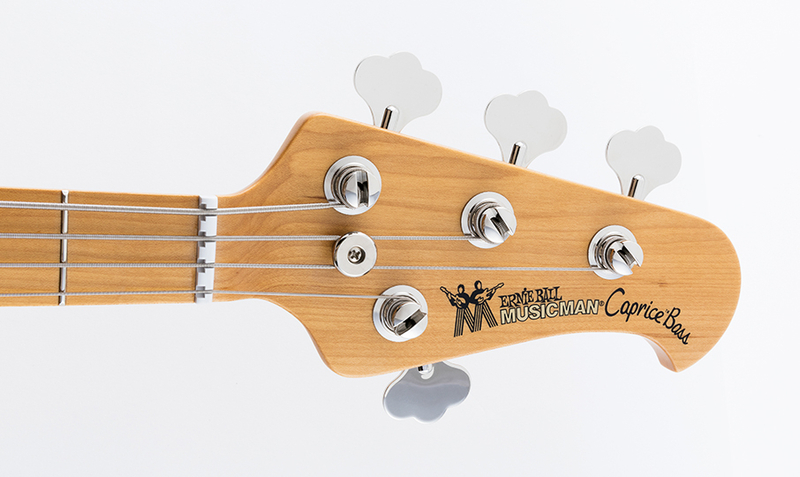 The Caprice is a 2-pickup version of the Cutlass, and it has a few of the traditional features that you would expect from a MusicMan bass, including the 3+1 headstock and pickups with large pole pieces. Things vary a bit after that, starting out with a body shape (alder) that is more P-Bass than Stingray. The top-loading bridge looks familiar, but a closer look reveals that the plate is smaller and does not have the large bolts into the body. 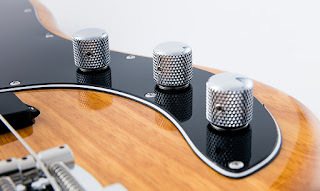 There are the usual choices of rosewood or maple fretboards, and both necks have Schaller tapered BM tuners and compensated nuts, which is not unusual for their product line-up. Then there is the pickup configuration, which borders on heresy as it comes with a set of P-J humbucking pickups. The pickups each have their own volume control, which sends the output through a single tone knob for both pickups. I like this set-up as it is very versatile, and avoids the “knob farm” syndrome. I finally had the chance to see a Caprice bass in person the other day, and it was an impressive instrument with a classic aesthetic and a nice balance on the strap with a sub 9-pound weight. The craftsmanship was amazing, with jewel-like fretwork (21 frets) and a lovely yellow vintage tint to the maple portion of the neck. The neck has more of a jazz bass feel with its 1.5-inch nut width and 7.5-inch fretboard radius. As this was an artist model, it was in a custom color, but normal folks have a respectable number of color choices, including natural, burst, coral, white, diamond blue, and my old favorite, black. After this I got to experience the bass’ sound in the real world, at an outdoor club gig with 3 guitars and drums. The rig was a Mark Bass amp and 2x10 cabinet, and overall volume levels were pretty reasonable, as it was an outdoor restaurant situation. The bass player also had a Bongo and a Big Al, and there was a surprisingly powerful sound with the Caprice when compared to the active electronics-equipped basses. The mids were crazy good, and it overall it cut through the mix nicely, so it was a winning choice; my general impression was that this would be a good bass for blues, rock, and country gigs. Of course, the bass player had a lot of experience, and a lot of tone comes from the fingertips and touch, but everything is there with this instrument to help make a player successful on stage. The MusicMan Caprice bass looks cool and sounds good, and if you are looking for a new bass and can pull together $1700 (starting street price), you will not go wrong unless you play leftie or are looking for a fretless bass. For sure, try one out and see what you think, I would be interested to hear what others have to say!